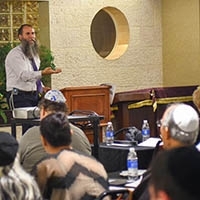 At Chabad, all Jewish holidays are community affairs in every sense. Hundreds attend Chabad’s High Holiday services. Many more join in pride for its Chanukah parade. A lively spirit of story and song captivates young and old at themed Purim parties, community Passover seders and Friday night dinners. Our Hebrew School, Camp Gan Israel, Torah Academy and Mommy & Me programs have a distinctive way of kindling a child’s curiosity about their culture and heritage from the earliest of ages. Pre Holiday workshops transform age-old Jewish rituals into hands-on projects that are educational and fun. The "Shofar Factory" and "Matzah Bakery" enable children to discover Jewish practice in the most stimulating and meaningful way of all: they experience it. Whether visiting the sick or the incarcerated, counseling the troubled, comforting the bereaved or providing for the needy, Chabad opens ints doors and its hearts to those in crisis or distress. 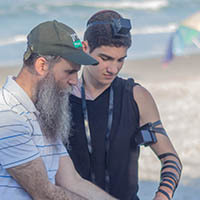 Be it a helping hand, a comforting shoulder or a timely referral, Chabad discreetly dispenses love, wisdom and financial support to all who reach out for it. It goes out and brings the joys of tradition to the community via creative outreach programs. 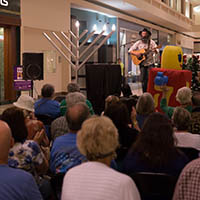 Chabad’s outreach endeavors have undoubtedly enhanced Jewish life in Brevard and Indian River counties.